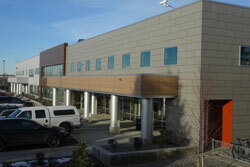 Home > Fiberesin Industries, Inc.
Stonewood Architectural Panels are manufactured by Fiberesin Industries. Fiberesin is an expert in the art of thermal fusion, mixing smarts and experience to create engineered materials of exceptional performance, strength and consistency. 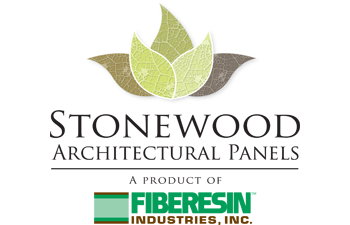 All Fiberesin products are proudly manufactured in Wisconsin from predominately domestic raw materials. 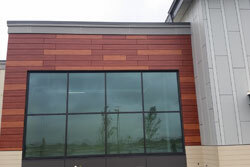 Stonewood Architectural Panels meet the ASTM E-84 Class A and B fire rating. 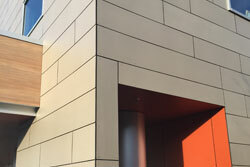 Stonewood Architectural Panels are UV resistant and designed withstand all weather conditions. 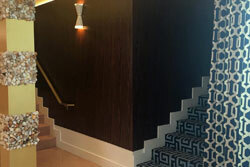 Fiberesin has been manufacturing solid phenolic panels for 60 years for both interior and exterior applications. The company entered the rain screen market by producing exterior cladding as on OEM supplier in early 2010 for third parties. Fiberesin launched the Stonewood Architectural panel product line later that year. 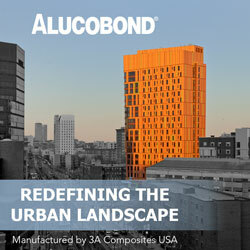 Since launch, the product has been used in dozens of architectural projects around the United States. Fiberesin is vertically integrated, with its own paper treatment plant that is separate from the pressing/fabricating plant. This allows for end to end control of the production process, from the resin treating through pressing and fabrication. Fiberesin is a leading value-add manufacturer of custom engineered materials, components and finished goods serving the furniture, building products, recreation and medical markets, among others. The company utilizes proprietary technology to create engineered materials of exceptional performance, strength, appearance and consistency. Fiberesin’s products are of greater quality than alternative products and are less costly, providing customers with tremendous value. Fiberesin is recognized by its customers for superior quality and quick turnaround. The company is vertically integrated and provides custom panel manufacturing, fabricating, finishing and assembly capabilities.